The good folks at the Consumerist posted up an article today for Grilled Cheese Day. They linked to a video (below) from the science boffins at the American Chemical Society. I have no problem with their short list. All cheeses that I am fond of, (yes, even the melty goodness that is American Cheese). A manchego grilled cheese would go down just fine! ...love so many kinds of melted cheese...a grilled ham and melted swiss on rye is amazing......so many choices....great topic!!! I do not care for grilled cheese.......as in sliced American on Wonder bread. 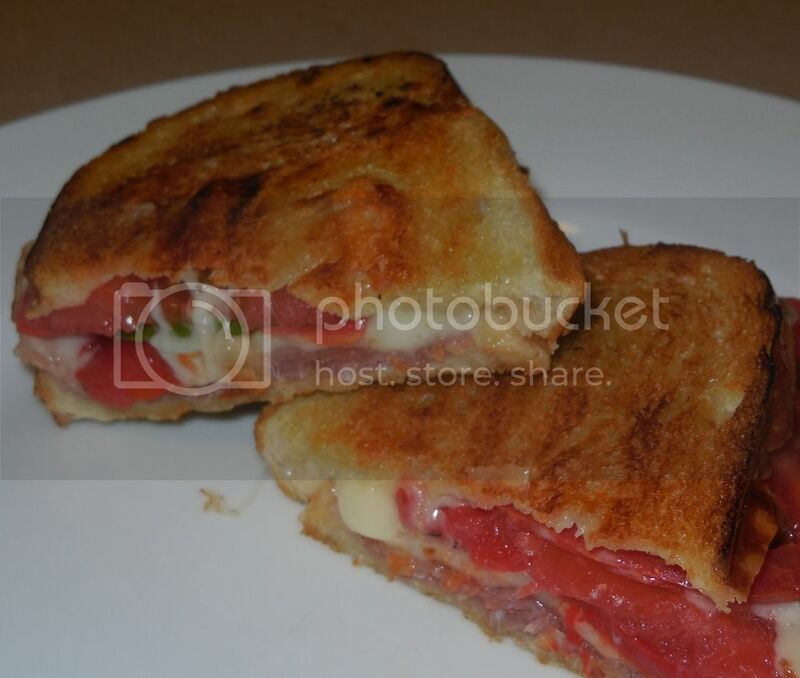 I do like ham, provolone, tomato and basil grilled on Italian bread. That one is the best ever. Another that I like (but barely comes close to that one) is broccoli rabe, sweet Italian sausage and provolone. By the way, am I the only human being left on the face of the earth who calls them toasted cheese sandwiches? Growing up, my mom called them "melted cheese" sandwiches. ..never heard "grilled" cheese! My Mom called them "Toasted Cheese" sandwiches...her New England thing. I see some folks didn't watch the video. It's about the science of the grilled cheese. The cheese itself. I watched. Very interesting. Thanks! Give me Maroilles grilled on baguette with butter. OK. That works. But, heck, just give me Maroilles. The good folks at the Consumerist posted up an article today for Grilled Cheese Day. They linked to a video (below) from the science boffins at the American Chemical Society. I like the science angle but when it comes to a grilled cheese sandwich I prioritize flavor over form and texture. I wonder if anyone makes a home-use kit for testing cheese pH. Also, the brick of purported Colby in the video looked to be a Colby blend. That is not an authentic grilled cheese sandwich. I don't know about home use, but they do make ph testers for cheese makers. As for the colby, maybe it was a blend. I don't use it for anything in my recipes, as it's too oily and breaks too easily. I'd never use it on a grilled cheese, for the same reason the folks in the video gave. Our secret is a blend of cheeses that allows us to nail the exact flavor we want, we have two one for grilled cheese sandwiches and one for our patty melts. We take the grated cheeses, then add emulsifiers and heat, comes out almost like the nasty american cheese slices in texture but the flavor is then based on the blend of cheeses you use. Gives us the best of both worlds flavor we want and that melt texture. You can try this just google making kraft style processed cheese and there are home type recipes you can play with. Took me about 6 months of playing to get our process down, but have used it now for about 12 years and we always get comments about our cheese. That'd be a fun toy to have but the price is a little steep for me. I should send the link in the original post to a few cheesemakers around here and ask them if they've ever considered putting the pH value on their labels. I call them 'toasted cheese' sandwiches, as often as not. can you let it go.....????????? I used to make toasted cheese sandwiches for my grandson using Boar's Head Cajun Style Turkey layered with roasted red peppers between slices of cheddar cheese and pepper jack cheese on sourdough bread. But I hear that wasn't authentic. I've never seen any cheese label with the ph listed on it, but it would be something cool for a cheesemaker to do, if the sciency aspect ever took off. I use American (white) because that is what I was brought up on. Sometimes my mother would use Velveeta, but mostly American. Of course a grilled cheese sandwich must come with Campbell's Cream of Tomato soup! That would be my choice, but lleechef won't allow any canned soups within 20 miles of the house. Good for her! I finally taught my grandchildren to enjoy my homemade cream of tomato soup! My daughter in law would still rather have the canned. My response was "OK, add 1/4 cup of sugar and 1 teaspoon of salt to the soup that I serve, and you will probably get the same taste, minus the chemicals. I've always called them "grilled Cheese" sandwiches. For my "grilled" cheese sandwiches, I prefer old fashioned, good quality American or, well aged Cheddar. No bacon but I love sliced tomatoes grilled along with the cheese on my sandwich. Must have good deli style pickles on the side. My Mom made the best toasted cheese with Colby and a bit of mustard. We loved the way the cheese "stretched" when we ate them.